If you have baseboards painted with latex paint, and you don't like the color or the finish, consider removing it. Because of the rubber content in latex, sanding causes the latex to gum up. Latex gums up when the friction caused by the sanding heats the latex. Baseboard trim covers the gap between the flooring and the wall. If you have baseboards painted with latex paint, and you don't like the color or the finish, consider removing it. Because of the rubber content in latex, sanding causes the latex to gum up. Latex gums up when the friction caused by the sanding heats the latex. Use a chemical paint stripper to remove latex paint from a baseboard. Paint strippers come in gel and aerosol form, and take the hard work out of latex paint removal. Cover the surfaces above and below the baseboard. This includes the flooring and the wall. Stick 2-inch, low-adhesive masking tape to the floor and to the wall. Press the side of the tape closest to the baseboard down with your fingertip. Leave the side of the tape furthest from the baseboard loose. Stick painter's plastic beneath the loose edge of the masking tape on the floor. The plastic should span the entire length of the baseboard. This will protect the flooring from the paint stripper. Stick a 12-inch piece of masking paper into the loose edge of the masking tape on the wall. The paper should span the entire length of the baseboard. This will protect the wall from the stripper. Tear short pieces of tape off the role and stick the paper vertically to the wall. The surfaces above and below the baseboard should now be masked off. Open a door and a window to create a cross-ventilation. Turn on a floor fan to keep the air fresh. Put on a paint respirator, a pair of rubber gloves and safety glasses. Open a can of chemical paint stripper with the end of a flat-head screwdriver. Take a paintbrush and dip it into the stripper. Apply a generous 1/4-inch layer of paint stripper to the entire length of the baseboard. Wait for 24 hours for the paint stripper to do its job. The paint should wrinkle and peel during this time. If you use an aerosol stripper, shake the can, and spray the baseboard with a 1/4-inch layer of the stripper. Scrape the paint off the baseboard with a putty knife. Scrape the removed paint into an empty metal paint can. Scrub all of the paint and stripper residue off the baseboard with warm water and a rag. Use a disposable, 2-gallon bucket to hold the water. Remove the masking tape, paper and plastic when the job is complete. Use the tip of a flat-head screwdriver to get paint out of the grooves in the baseboard. 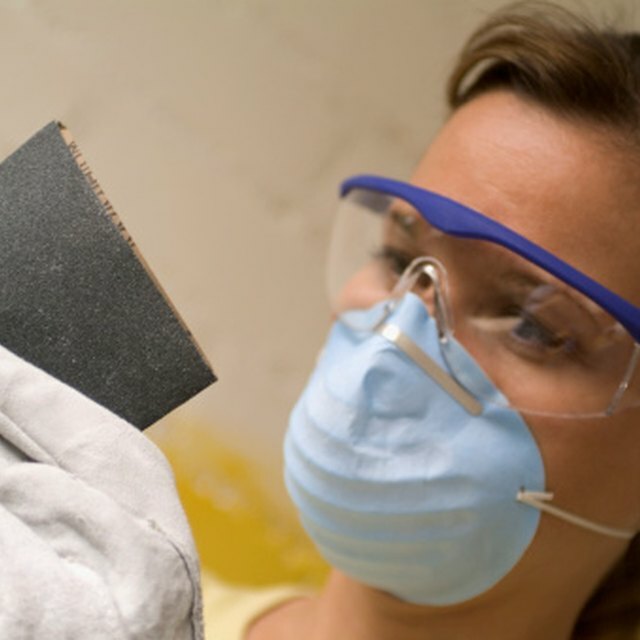 Dispose of the chemical paint stripper in accordance with local hazardous waste disposal laws. The vapors of chemical paint stripper are harmful when inhaled. They are also flammable.